Gov. 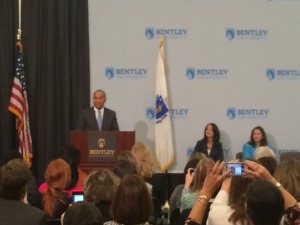 Deval Patrick launches a Corporate Challenge to get more women in the workplace. On Friday Oct. 10, Gov. Deval Patrick and Bentley University’s Center for Women and Business officially launched its highly anticipated ‘Corporate Challenge’ and the Digital-11 team was there to document it all. 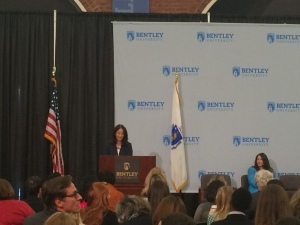 The Challenge, which was a recommendation by the Governor’s Successful Women, Successful Families Task Force, is an initiative that will encourage and help participating companies increase the number of women in their ranks, particularly in the C-suite positions, as well as update and maintain company related gender inclusion policies. Fourteen companies have signed on so far, but the Governor has said he would like to get to 100 participating companies in the initiative by the end of the year. 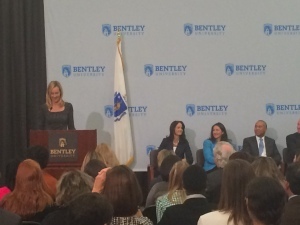 Betsy Myers, the Founding Director of the Center for Woman and Business, speaks to the importance of leveraging women and their talents at all levels of management. Bentley University’s Center for Women and Business will provide resources and guidance to the participating companies. Massachusetts Secretary of Labor and Workforce Development Rachel Kaprielian and Founding Director of the Center for Women and Business Betsy Myers spoke at the event. The following 14 companies are participating in this multi-year Challenge: Raytheon, Liberty Mutual Insurance, National Grid, Suffolk Construction, Eastern Bank, Vertex Pharmaceuticals, Rockland Trust, Santander Bank, Citizens Financial Group, Biogen Idec, State Street, Dassault Systemes, Pearson and The Bullfinch Group / Guardian Life Insurance.